Dear Yogesh, Thank you for explaining in very simple way the usage. It is indeed very helpful to all. Hi I used the same figure at same cells with 14 % , instead of 14.25 as decimals were creating problem and exact same formula but i am getting value 233333.34 . WHy ? do i need to enable something in excel . i checked again the formula and values but i dont get EMI Value that you have got in the example . where i am making mistake ? I am looking for a formula to calculate the PPF. Each month separately and whole year accumulated interest. 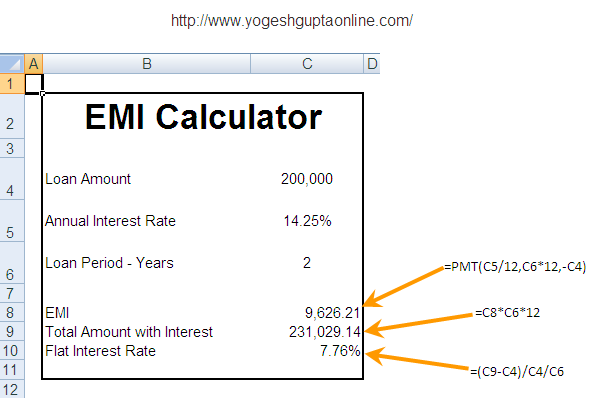 What is formula for calculating EMI of a sim0le interest loan. why do you have taken principal as negative(-) .